Concentrate on the trail, not your load. 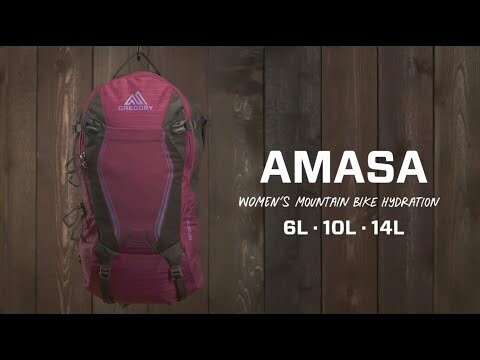 Women's-specific suspension is designed to keep the pack still and prevent bouncing. The hipbelt is easily repositioned to accommodate your riding style or body position, especially on hills. Includes a quick-drying Gregory 3D Hydro reservoir with magnetic DryLock bite valve that attaches to the magnetic sternum strap. Fabric is lightweight 210-denier ripstop nylon. Women's-specific Shift RS suspension maximizes stability and provides no-bounce performance. Vertically adjustable hipbelt moves up or down to compensate for body position, riding style and trail grade. Matrix ventilated foam in the backpanel and harness provide airflow and evaporative cooling. Interior pockets and sleeves carry spare tubes, energy bars, patch kits and both a tire and a shock pump. Hipbelt pockets are perfect for snacks or other small items. Includes a removable zippered pouch with internal organization to hold your tools. Hydration compatible with dedicated hydration sleeve and hanger loop.